If you have been struggling to get a good night’s sleep, wake up many times throughout the night, or wake up feeling tired and groggy, you might be struggling with obstructive sleep apnea. Sleep apnea is more common that you might think, affecting more than 18 million adults in America, many of whom never receive a diagnosis or seek treatment. 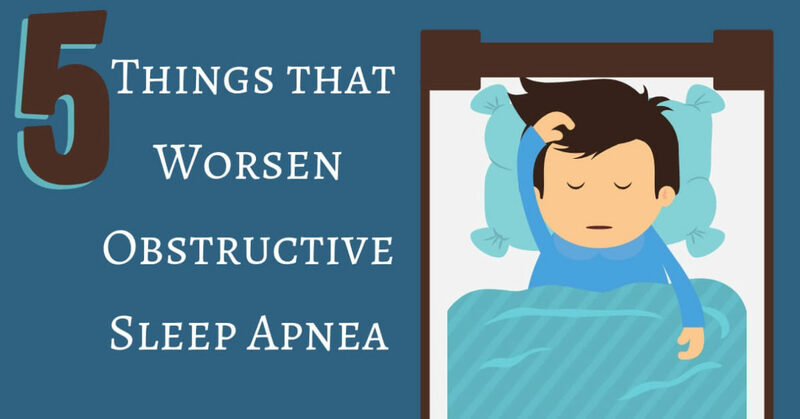 If you think you might have sleep apnea, or have been having trouble sleeping at night, here are 5 things that worsen obstructive sleep apnea. Obstructive Sleep Apnea is a condition that affects your ability to breathe during the night. The muscles in your throat that are tense during the day and relax at night. However, when these muscles relax too much, they can block your airway, and your breathing will stop. Your brain senses the distress, and wakes you up so the muscles will tighten again and open your airway. If you have obstructive sleep apnea, you could be waking up hundreds of time a night, but not remember in the morning. Does your loved one complain that you snore loudly, or notice that you stop breathing in the night? Do you feel exhausted when you wake up in the morning? You may have sleep apnea. Continuously waking up affects your sleep cycles, and you’ll be unable to get enough REM sleep, leaving you tired and groggy throughout the day. If you have sleep apnea, you’re likely to be easily irritated, feel tired all the time, and have trouble focusing on tasks. You also risk high blood pressure, increased risk of heart disease and stroke, and insulin resistance. Weight Gain: A common risk factor for sleep apnea is weight gain. Having a few extra pounds could add more fat around your airway, and a thicker neck makes it far easier for your airway to close during the night when your throat muscles relax. In fact, nearly 50% of those with sleep apnea are considered overweight, and when you gain some weight your sleep apnea will worsen. Maintaining a healthy weight is not only good for your overall health and wellbeing, it will also reduce your chances of struggling with sleep apnea. Sleep Position: The position you sleep in will make a big difference to your experience of sleep apnea. Sleeping on your back will worsen sleep apnea, since laying on your back will place the full weight of the tongue on your airway, and increase the likelihood of having a blocked airway while you’re sleeping. The best position is to sleep on your side, as this will allow you to get a sound sleep without waking during the night. Excessive Drinking: Alcohol is another risk factor for sleep apnea, and will worsen the condition. Alcohol contributes to muscle relaxation and may make your throat muscles, as well as the tongue, relax far too much. You can still enjoy a glass of wine or a pint with friends, but if you want a good night’s sleep, don’t over-indulge. Smoking: It probably doesn’t surprise you that smoking would have an impact on your airways. Smoking coats your lungs with irritants, and can affect the throat, upper airway, and soft palate. It can lead to symptoms of asthma which will enflame or narrow your airways, or lead to obstructive pulmonary disease. Smoking will compound any breathing problems you may have, and worsen your sleep apnea. High Blood Pressure: Another risk factor that will worsen sleep apnea is high blood pressure. There is a strong correlation between high blood pressure and sleep apnea, and roughly 30% of adults with high blood pressure also struggle with sleep apnea. Treating your high blood pressure could reduce your sleep apnea, and likewise managing your sleep apnea effectively will lower your blood pressure. If you think you might have sleep apnea, call us today at Sound Sleep Medical. The most common form of treatment for sleep apnea is a continuous positive airway pressure (CPAP) machine. This machine will keep your airway open throughout the night by directing air through your lungs. You’ll be able to sleep deeply without waking up, and feel refreshed in the morning.